A friend recently told me I am meddling into politics as of late. Well, this blog focuses on advertising critique and pop culture, and when politics (originally meaning polis-ethos or the ethics of living in a community) becomes pop culture so it becomes fair game to include it. We live in a world where entertainment became news and news entertainment. How so? Instead of reading "woman gets robbed" on the miscellaneous section - Kim Kardashian's Paris robbery was first page headliner and instead of reading "official release from the president of the United States" we have decipher a tweet in 140 characters or less. Interestingly the man who wrote "The Art of the Deal" could not even get his own party to agree on a new healthcare bill which is supposed to replace the "failing" signature health bill which is supposed to bring some basic healthcare measures and which was issued by his predecessor (a bill affectionately called Obamacare) with something "terrific" (which turned out terrifying). 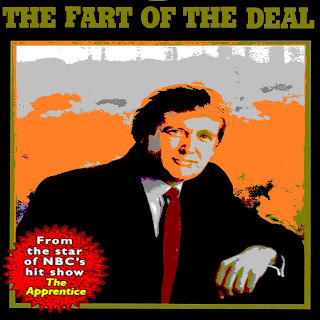 Hence the new book "The Fart of the Deal".